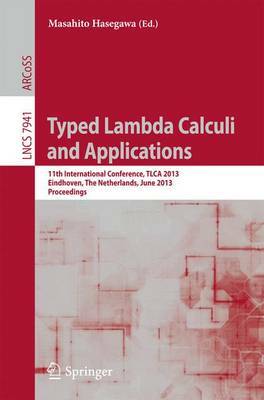 This book constitutes the refereed proceedings of the 11th International Conference on Typed Lambda Calculi and Applications, TLCA 2013, held in Eindhoven, The Netherlands, in June 2013 as part of RDP 2013, the 7th Federated Conference on Rewriting, Deduction, and Programming, together with the 24th International Conference on Rewriting Techniques and Applications, RTA 2013, and several related events. The 15 revised full papers presented were carefully reviewed and selected from 41 submissions. The papers provide prevailing research results on all current aspects of typed lambda calculi, ranging from theoretical and methodological issues to applications in various contexts addressing a wide variety of topics such as proof-theory, semantics, implementation, types, and programming.